Written by Vignesh Karthik KR. 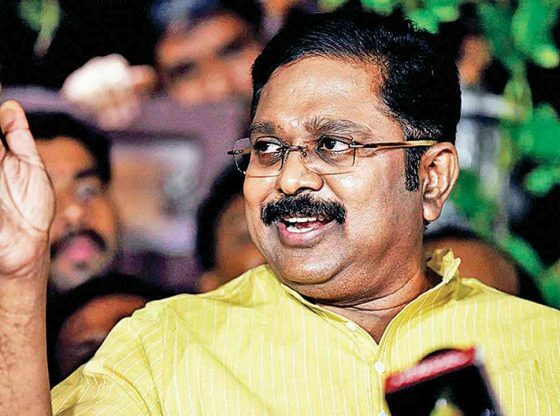 With the two major Dravidian parties in Tamil Nadu (TN) forming broad alliances in advance of the Indian general elections, TTV Dhinakaran – the leader of Amma Makkal Munnetra Kazhagam (AMMK), the breakaway party from the All India Anna Dravida Munnetra Kazhagam (AIADMK) – has announced publicly that his party will contest all seats across the state together with the Social Democratic Party of India (SDPI) as a single-seat ally. While the case over AIADMK’s election symbol of the twin leaves did not turn out in Dhinakaram’s favour, he continues to claim that his faction represents the soul of AIADMK. Further, he has said that his party’s MPs would select the candidate for prime minister, indicating a close fight at the national level in the elections. Here I shall attempt to discuss the substance of Dhinakaran’s claims and his prospects in the general elections, and in the process I will touch upon the larger damage he could do to the Bharatiya Janata Party (BJP) that is looking to make inroads in Tamil Nadu through its alliance with the AIADMK. It is worth noting that after the BJP’s fallout with an important partner like the Telugu Desam Party (TDP), a southern state like Tamil Nadu is key for it to regain support. Although the AMMK does not explicitly claim so, the dominance of the Mukkulathors within the party is conspicuous. The Mukkulathors are a middle caste group (also called Thevars) consisting of three castes – the Kallars, the Maravars and the Agamudiyars – which accounts for 8 per cent of the population, and the buzz within the party and among observers is that AMMK seeks to consolidate the votes in the Mukkulathor belt and then spread out from there. If one were to map the belt in terms of parliamentary constituencies, the Mukkulathor caste group is numerically dominant in Ramanathapuram, Thanjavur, Theni and Virudhunagar and plays a significant role in Madurai, Mayiladuthurai, Sivaganga, Tenkasi (reserved for a candidate belonging to the Scheduled Castes), Thoothukkudi, Tiruchirappalli and Tirunelveli. The above inference is made on basis of the 1931 caste census and the general observation that the majority of the contesting candidates belong to the Mukkulathor caste. The Mukkulathor caste group is regarded to be politically exuberant and has its people spread across various political parties. For instance, there have been MPs from the community in the Indian National Congress (INC) and the Dravida Munnetra Kazhagam (DMK) as well. It is also represented in small caste-specific parties like the Mukkulathor Puli Padai and factions of the Forward Bloc. The prevalent notion is that a sizeable portion of the Mukkulathor caste group has voted continuously for the AIADMK, and that the small parties have pledged their support to bigger parties. However, an analysis of election results does not give us a clear picture about this at the moment. The eleven Mukkulathor-dominated constituencies listed above have displayed trends that do not satisfy a simple caste or party equation. The DMK and its allies secured eight of the eleven constituencies in question during the 2009 general elections. The 2014 general elections saw a complete reversal, however, with the AIADMK winning all of them. The eleven parliamentary constituencies each house six assembly constituencies, and the results of these sixty-six assembly constituencies also reflect the non-allegiance of the constituencies to a particular party. The 2011 assembly elections saw the AIADMK alliance win fifty-six of the sixty-six assembly constituencies, while the DMK alliance won the remaining ten. In the most recent 2016 assembly elections there was a minor shift, with the AIADMK alliance winning forty seats and the DMK alliance winning twenty-six. Reviewing the four parliamentary constituencies where the Mukkulathor caste is numerically dominant, it was found that not one of them had the same alliance in power across the two general elections that have been conducted in the last ten years. Eight of the twenty-four assembly constituencies belonging to these four parliamentary constituencies did not vote the same party into power at both the 2011 and the 2016 assembly elections. Interestingly, instead of focusing on the caste element in his public rallies, TTV Dhinakaran talks only about Amma’s governance in the person of the former Chief Minister and General Secretary of AIADMK, the late. J. Jayalalithaa, and does not resort to caste references. The continuous reiteration of Jayalalithaa’s name, the naming of his own party, and the decision to contest the elections as a faction of the AIADMK together imply that Dhinakaran is trying to appropriate a larger identity beyond caste and to garner support across all castes by addressing the issues of the people. Notably, BJP’s unpopularity in Tamil Nadu is unmatched, and in this context Dhinakaran’s speeches and press interactions present him as a witty, composed and casual leader, thereby positively influencing his image. At this juncture, while breaking away from AIADMK initially seemed to strip away any chance of garnering support across caste groups for the AMMK, Dhinakaran’s decision not to go in for immediate alliances with other caste parties makes him appear to be a stable player who is playing the long game. This is in contrast to the BJP, which has hastily forged an alliance with parties like the Pattali Makkal Katchi (PMK) based on linear caste arithmetic, thereby worsening its image further. However, with only limited time left, Dhinakaran’s ability to win seats remains to be seen. A few of Dhinakaran’s supporters and political observers believe that the AIADMK cadres will support his party on the ground, as they are not happy with the way AIADMK is functioning or its subservience to the BJP. Dhinakaran also claims that most of the AIADMK’s workers are with him. In terms of voters, senior members of the AIADMK are certain that AMMK’s presence will dent the AIADMK’s vote bank and that disheartened AIADMK loyalists will choose AMMK over the DMK. In this case, there is a chance that AMMK’s vote share could increase significantly and the party could even occupy second position because of the unpopularity of the AIADMK and its alliance partners. In conclusion, one can safely argue that the elections in Tamil Nadu are being fought on complex terrain. Going by the arguments made above, the prospects of AMMK in terms of seats do not look very favourable at the moment, although the party’s vote share could be substantial. In other words, Dhinakaran is essentially harming the prospects of the BJP in the state, which was hoping to make its entry into Tamil Nadu in the wake of the demise of Jayalalithaa and the subsequent weakening of the AIADMK. For a person who claims to be a small player, TTV Dhinakaran is here to stay and should not be underestimated. *The estimation of the population of Thevars is drawn from The Times of India, Chennai edition, 13 March 2019, p. 10.